"All the men I've known have needed to be shaped and molded and manipulated. Finally I've met a man who knows how to do it himself." It’s also an episode about a frustrated engineer, once again facing computer problems. When he faces the futuristic version of the Blue Screen of Death, he wants to begin reprogramming and install Yosemite. But Sisko is concerned this’ll shut down the station overnight, forcing people to check DS9mail on their chest-phones. A strange ship comes through the wormhole, alarming the station. “Are our computers compatible?” Sisko asks, proving he might know more than he admitted to O’Brien, and definitely more than the writers of Independence Day. Or does he? Ignoring annoying ambassadors, he immediately… asks people to download information from the unknown probe. The magnitude of the stupidity here! I was yelling DON'T OPEN THAT ATTACHMENT! It’s also a story about the heart of a shapeshifter. Odo’s desperate bid for romantic advice from Sisko is a great moment. Odo being alone has had some consequences; one of these is an unexplored well of loneliness and a bunch of walls. Who better than a Betazed to take down those walls? Every one of Majel Barrett’s lines in this episode is an unexplored gem. She decides to trap Odo into a response; at this moment, the station stops responding. It’s still working - just not letting people control it. And Odo and the Holy Ring Heir are literally trapped together in the elevator. Thanks, Sisko, for downloading alien crap. Barrett and Auberjois have great energy. And Barrett, for all her prattle, gets Odo’s walls down. We learn he grew up at a research center, that his looks are molded on a particular Bajoran. We learn about his loneliness. We learn he did tricks… I feel a lot of empathy for Odo. He finally opens up to Barrett in a way he’s opened up to nobody else… and she opens up to him. And it’s painful and it’s honest and the whole scene just works. O’Brien, Sisko and the crew try to wrench control back but wind up making things worse; they cause chaos all over the station as the alien mind strikes back. Ambassadors’ lives are in peril. The final solution saves the station and many people, but leaves the question of what will happen to the “pup” in the future. Hopefully it’ll help our erstwhile Engineer. The life-saving certainly helped the reputation of Dr. Bashir. And Odo? I think he finally had a real human connection, instead of making the appearance of one. When Lwaxana grabs Quark by the ears and tries to force him to hunt down the thief. Lwaxana’s dress when she goes after Odo the first swipe. OMG. The presence of Anara, another technician, was cool. Often in ST:TNG it seemed like five people were running a ship of thousands. When the show expanded to include the second rank, like Barclay and O’Brien, it matured to a new level. We’re seeing this happen earlier in DS9. 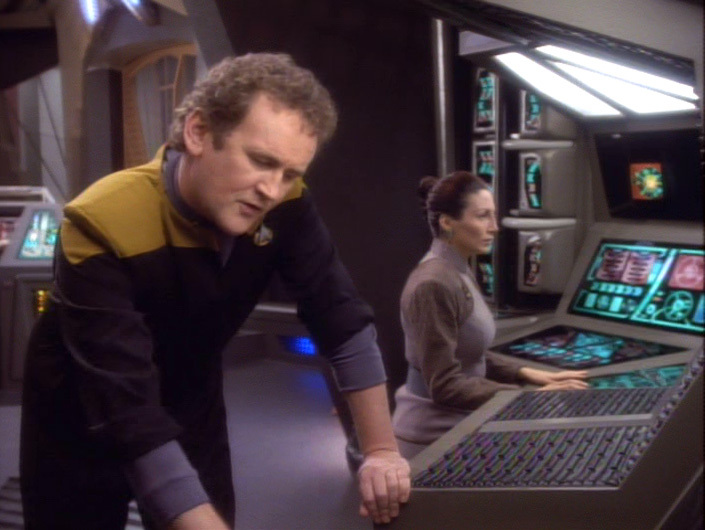 O'Brien seems to need problems to solve. He's frustrated when he has his everyday work. I think he's been spoiled by the variation he saw on the Enterprise. Lwaxana: We've learned that on this station, you are the thin beige line between order and chaos. Lwaxana: I understand you're a shape-shifter. Odo: I have six pylons that need a complete security sweep. I don't have time for romantic interludes. Lwaxana: My daughter and I were once trapped aboard a Ferengi cargo ship and it was dreadful. Well, all right, it wasn't actually dreadful, it was mildly lamentable. And it was all because of that loathsome Daimon. Well, actually he wasn't altogether loathsome. He was just slightly repulsive. But he did have a certain charm, in an insufferable sort of way. Of course he was totally at the mercy of his uncontrollable passion for me, which means he wasn't all bad now, doesn't it? You know, it wasn't all passion. There was some... negligible commercial interest involved, but oh, the passion, that was perfectly real, and kind of sweet, in a way. He was so helpless. At first it was totally a question of expediency when I made love with him. What are you looking at? Odo: (taking a deep breath) Hmm? Oh nothing. I was just wondering how many volts are in that exposed circuit. Go on, go on. I admit, I rather like the character of Lwaxana Troi. (Her daughter's a dullard but that happens.) I've gotten the impression over the years that she's an intensely polarizing figure among Trekkies, a lot of whom hate her guts. It's somewhat understandable because Lwaxana had a gift for starring in some truly wretched episodes, most infamously "Menage a Troi". And that one with Alexander and the mud bath. But still it's hard for me to dislike Lwaxana Troi or blame her at all for bad episodes. She stood out from the general TNG blandness as a character with a genuine personality. So much of the characterization on TNG seemed kind of fake and forced, as if the writers felt their jobs were done once they assigned each major character a hobby. So you get Picard stiffly pretending to be a Sam Spade-style detective or Riker affecting a unconvincing fondness for jazz trombone. 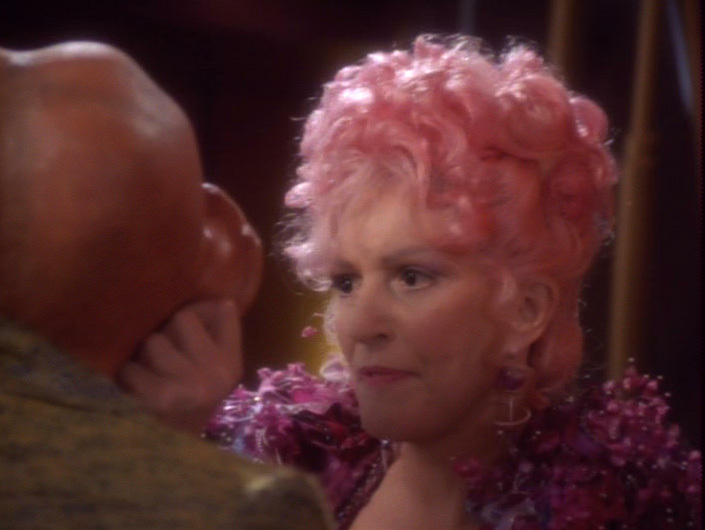 Lwaxana's character never seemed contrived, though. She was enthusiastically herself, and it was refreshing. Wow, Fortikos, what a fantastic way of putting my appreciation of Lwaxanna into words. I love Barrett's energy and how she manages to make Lwaxana explode onto the screen. In two minutes she's centralized everything on herself. It's an amazing talent.